For most of us, the unini­ti­ated, Lloyd’s imme­di­ately con­jures up vis­ions of the vast insur­ance giant. The other aspect of Lloyd’s is the part known as Lloyd’s Register. Brian has worked for LR which is a well-respected con­glom­er­ate derived from the same ori­gins. It is owned by the Lloyd’s Register Foundation, a UK char­ity ded­ic­ated to research, edu­ca­tion and sci­ence. In par­tic­u­lar, they pride them­selves on know­ledge, integ­rity and tech­nical excel­lence. Their cli­ents are given con­fid­ence that their assets and busi­nesses are safe and depend on LR’s com­pli­ance and tech­nical know-how. LR’s turnover is £1.3 bil­lion, and they employ 9,000 staff. It star­ted from the ori­ginal coffee house concept as Lloyd’s Insurance in 1688. LR was the first, in 1760, to ensure that ships were built and main­tained to an appro­pri­ate stand­ard for safety and effi­ciency. John Angerstern, a mech­anic and engin­eer, was appoin­ted the first Chairman of LR, and 16 sur­vey­ors – either master mar­iners or ship­wrights – were employed for inform­a­tion and advice. The first register of ships was soon pro­duced, con­tain­ing inform­a­tion on 4,118 ships from 16 dif­fer­ent ports. Thomas Chapman was appoin­ted the first sec­ret­ary of LR in 1834, estab­lish­ing new sys­tems which are still in use today, such as for­eign bases around the world which were estab­lished with dis­cip­line and cred­ib­il­ity. Suirius was an early iron steam­ship cer­tki­fied by LR. Lizzie Leslie was the first iron sail­ing ship clas­si­fied as ‘100 A1’ in 1870. The 19th cen­tury saw the intro­duc­tion of com­pos­ite mater­i­als for ships such as the Cutty Sark, and A. Cornish was a sur­veyor between 1900 and 1909 who con­duc­ted research for the Cunard Line on the Mauritania and Lusitania. 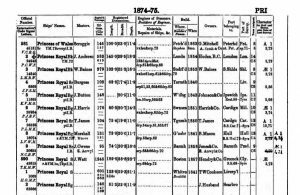 An excerpt from Lloyd’s Register of 1874–75, with details (the last vessel shown) of the SS Princess Royal, owned and oper­ated by Capt John Husband, great great uncle of our sec­ret­ary Graham Snowdon! The Mirex, a tanker for trans­port­ing crude oil from the Black Sea to the UK, was registered for Shell Oil in 1892, and the Bakin was the first modern oil tanker. From 1920, LR began inspec­tion of oil stor­age tanks, built for use in the Middle East. The inspec­tion of elec­trical gen­er­at­ing plants, par­tic­u­larly boil­ers, came within LR’s remit . Also in 1920, Joseph Isherwood over­saw the con­struc­tion of SS Fullgar, the first all-welded seago­ing tanker to be registered 100 A!. The Beldis, built in 1924 by Armstrongs for the Norwegians, was the first heavy-lift ship. LR were appoin­ted inspect­ors of the Americas Cup yachts in the 19th cen­tury, and they still inspect luxury yachts. In the 1930s they were the inspect­ing author­ity for air­craft, although this work was later taken over by the Civil Aviation Authority. During World War II, LR assisted ship­build­ers in recon­struct­ing their mer­chant fleet after many losses during the con­flict They were also involved in the invest­ig­a­tion into many marine dis­asters, such as explo­sions on bulk car­ri­ers, and their scope now also covers the design and inspec­tion of oil rigs. Our speaker, Brian Smith, con­tin­ues his involve­ment today to re-establish mer­chant navy appren­tice­ships in Hull. This, hope­fully, will re-establish Great Britain’s place in the naut­ical world. It was an excel­lent present­a­tion, by a gen­tle­man who knows his busi­ness.